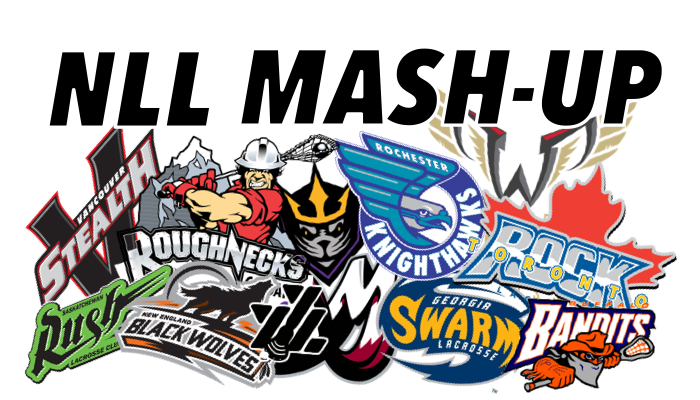 As the NLL heads down the final third of the season there are a couple of main themes. First, the West playoff seeding for all intents and purposes are done. SASK is going to be the number one see and COLORADO is going to host CALGARY for the right to play the RUSH. As far as the East goes, who knows. Just when you think you have it figured out things get turned upside down again. Going into this weekend NEW ENGLAND is in 1st at 6-5. Followed by TORONTO at 6-6, ROCHESTER, BUFFALO and GEORGIA all stand at 6-7. The top three qualify for the playoffs. In the back half of a home and home the ROCK took the victory over the BLACKWOLVES at MOHEGAN SUN. Week prior the BLACKWOLVES came out on top 8-7 in OT. The game had playoff intensity as both goalies once again were on point. STONE COLD AARON BOLD had 44 saves for NEW ENGLAND, while NICK ROSE had 38 for TORONTO. When the game ended the ROCK were clearly relieved and ecstatic to keep pace with the rest of the division. This was a huge confidence boost for the ROCK, as it was the first victory since TOM SCHREIBER was injured in ROCHESTER on FEBRUARY 10. The game was much closer than the 14-9 final. The score stood 10-9 with ten minutes left before the ROCK scored the final four goals including a penalty shot and an empty netter. The difference in the game was the play of ADAM JONES (2g, 5a) & KIERAN McARDLE (3g,2a). Over the two previous games JONES was held goal less and only had 2 assists. He was able to work the pick and roll with MCARDLE as they had great chemistry all night long. As far as McARDLE goes his physical game was very surprising as he showed some serious grit as well as the ability to get in great shooting positions. For the BLACKWOLVES once again KEVIN CROWLEY was the catalyst, he had 3 goals. If there is a better offensive player in terms of getting his own shot off I haven’t seen him. He also hit the 500 point mark for his career as well. STEPHAN LeBLANC continued his consistent play with (2g, 4a), JOHNNY POWLESS was also solid on the left side with (2g, 1a). New addition CALLUM CRAWFORD shot 1 for 13 adding 3 assists. After that like many games this season secondary scoring was hard to come by for the BLACKWOLVES. In the end the ROCK played with a little more of a sense of urgency as they held a 80-69 loose ball advantage. SCHREIBER was warming up before the game and looked like he is getting closer. YumYumLax spoke to him as well. I would look for him to return in a couple of weeks. The ROCK are going to be dangerous when he returns! A couple of weeks ago the BANDITS looked like the best team in the league. Coming off a loss at home to VANCOUVER they ran off four wins in a row, including handing SASK their only home loss. Since then they have dropped four in a row as their record falls to 6-7. They lost to SASK to start the weekend. The RUSH were certainly ready to avenge their home defeat at the hands of the BANDITS, they never trailed in the game in cruised to a 16-10 win. THE BANDITS also seemed to be to caught up rough play in the GEORGIA game as they were punished with four power play goals against, all in the first half as the trailed 9-5. The BANDITS did come back and make things interesting in the 3rd cutting the SWARM lead to 9-8. But, LYLE THOMPSON stripped STEVE PRIOLO took it the distance at put in an insane twister shot on the run. GEORGIA went on to score 3 of the next 4 goals and took home the huge 14-10 win. This weekend their offense seemed to be off as their lefties struggled. JOSH BYRNE (1G, 3A), JORDAN DURSTON (1g, 3a) and MITCH JONES (2g, 4a) all had off weekends. The SWARM played without RANDY STAATS for the second straight game, but has the SWARM offense played better without him? Coach ED COMEAU has inserted an extra lefty in HAINA THOMPSON, that has given more floor time to LYLE THOMPSON and his game has taken off the last two weeks. His 5 goals this weekend were a season high, and he is starting to show his MVP form from last season. Coach COMEAU is going to have a tough choice when STAATS is ready to come back in! This weekend starts off again at MOHEGAN SUN, as the BANDITS and SHAWN EVANS come to town. I expect a lot of emotion in this game, maybe some rough stuff. I will pick the home BLACKWOLVES though. The BLACKWOLVES have the back to back this week as they travel to GEORGIA Saturday. I will go with the SWARM at home. The SWARM seem to be catching fire as they look to defend the title. After seeing the ROCK up close this past week I loved their spirit. I will say ROCK. How can you pick against the RUSH at home? Are the STEALTH going to win again this year? Also be sure to follow @YumYumLax on Twitter, Instagram, Facebook, etc. to get the scoop.